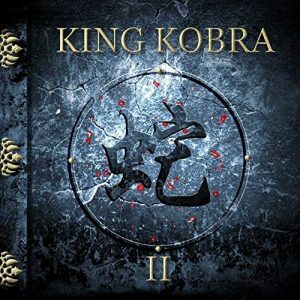 The second album by the post millenial King Kobra team, Carmine Appice, Paul Shortino, Mick Sweda, David Henzerling and Johnny Rod. The first, released in 2011, was a noisy agglomeration of bruising, blues based hard rock, lacking in originality and good tunes. The second album was released in 2013, and this time around, the competing tensions of old world traditions versus 21st Century freedoms bear fruit, sprinkling a generous share of streamlined hard rock songs across the album’s 12 tracks. Such as ‘Knock Em Dead’, ‘The Crunch’ and ‘Don’t Keep Me Waiting’. All escape from the sticky web of sludgy riffs and seismic rhythms that dominate elsewhere. These are precise, sharp and relatively friction free hard rock songs, with thin but sturdy melodies, creating adequate space for Sweda’s razoring solos and Shortino’s gravel throated howl. The standouts are probably ‘The Ballad of Johnny Rod’ – which cleverly copies the Coverdale trick of dressing up blues based boogie in FM Radio clothing – and the Southern Rock torch balladry of ‘Take Me Back’, with Shortino wringing maximum emotion from a simple lyric, buoyed by the redemptive swell of Hammond organ and an imagined gospel choir. That said, the album is not all sweetness and light . . . there are times when the band seem satisfied with the clutter of stifling, thick cut riffs, and find sanctuary still in the over familiarity of last century lyrics. But these songs are in the minority. Considering the band’s joint pedigree they’ve seemed reluctant to cash in the cultural hard rock stock they had accumulated over the years, but KKII appeared to be a positive signpost on the band’s journey. Disappointingly though, there was no KKIII.